NASA’s Commercial Crew program is finally nearing liftoff. In 2010, the agency announced its plan to use private companies to transport astronauts to and from the International Space Station. Earlier this week, we reported how one of those companies, SpaceX, tested its ability to deliver quick medical treatment to returning NASA astronauts. Now, we have footage of the Commercial Crew astronauts engaged in an even more literal dress rehearsal. On Friday, NASA posted a new video to its Commercial Crew Twitter account. 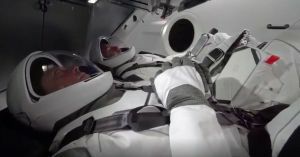 In the short clip, astronauts Bob Behnken and Doug Hurley are kicking back inside a Crew Dragon while wearing SpaceX spacesuits to familiarize themselves with the SpaceX craft’s interior and the functionality of the sleek suits. On October 4, NASA announced plans to launch an astronaut-carrying Crew Dragon in June 2019 following an uncrewed test flight in January 2019. Boeing, NASA’s other private partner in the program, will conduct its own launches two months later, in March 2019 and August 2019, respectively. Until then, expect to see NASA put both companies to the test again and again.